Looking for a premium restaurant template? You’ve landed in the right place. 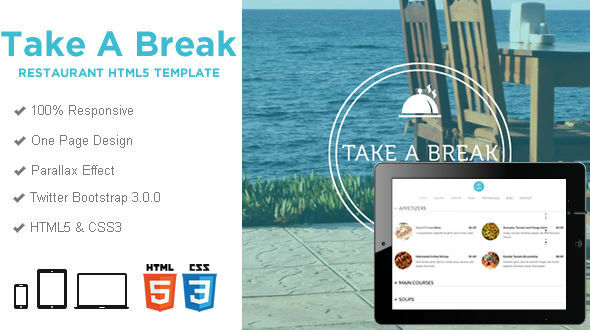 Take A Break is all you need to introduce your restaurant, cafe, bar to the world. It comes with a nice and smooth food & drinks menu presentation, not to mention that is responsive and looks awesome on mobile devices. It is based on Twitter Boostrap framework, has a valid HTML5 code and is great for SEO. The parallax effect for each section is smooth and empowers the overall site. Images used in preview are not included in the purchased package. They were just for demo purposes.